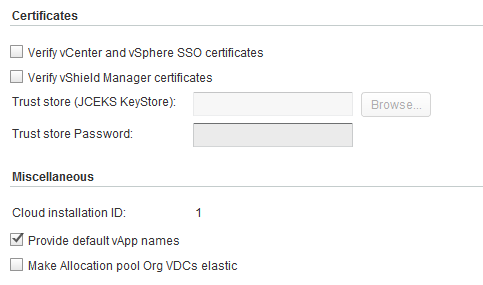 When vCloud Director is installed before creating vApp or anything, you should finish initial settings such as time sync, syslog server details or email setting. Actually I can say too much thing about these sections because they are up to you. First of all, I would like show each setting to you and then you are the one who should decide which one you need to configure. LDAP sync option. 24 hours is default. You can reduce or increase the time. Activity log history. These values are default but I think it can be increased depending on your requirements. I prefer 120 days and 60 days. Also, you may need to enable Debug option sometimes. Networking section is one the most important section of the configuration. I never change the IP address release time before. However, Syslog server is really important. I recommend to you to have a syslog server to analysis the logs. Localization and Timeouts. 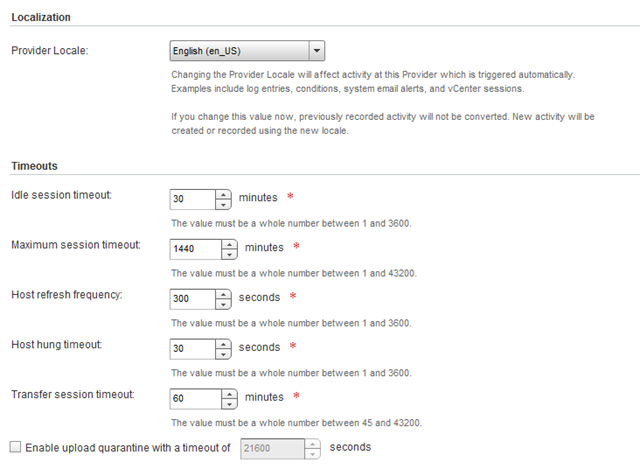 Timeouts needs to be changed here depends on your requirements. I prefer to reduce Idle timeout and Max session timeout. Max timeout session can be changed after you finished all your configuration on the system. If you have many costumers that have hundreds of servers, that time you can increase it because they will spend more time on the system.